Black/White Printouts and Copies are 10 cents per page, Color are now just 50 cents per page! To begin: know your AccessRio username and password. MyPrint allows you to add value to your MyPrint account by using cash, credit/debit card, or a PayPal account. 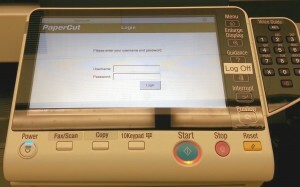 Cash users add money to their MyPrint account via the “bill loader” in the Library Copy Center. Know your AccessRio login and password. Use your AccessRio username and password to login to your MyPrint account. 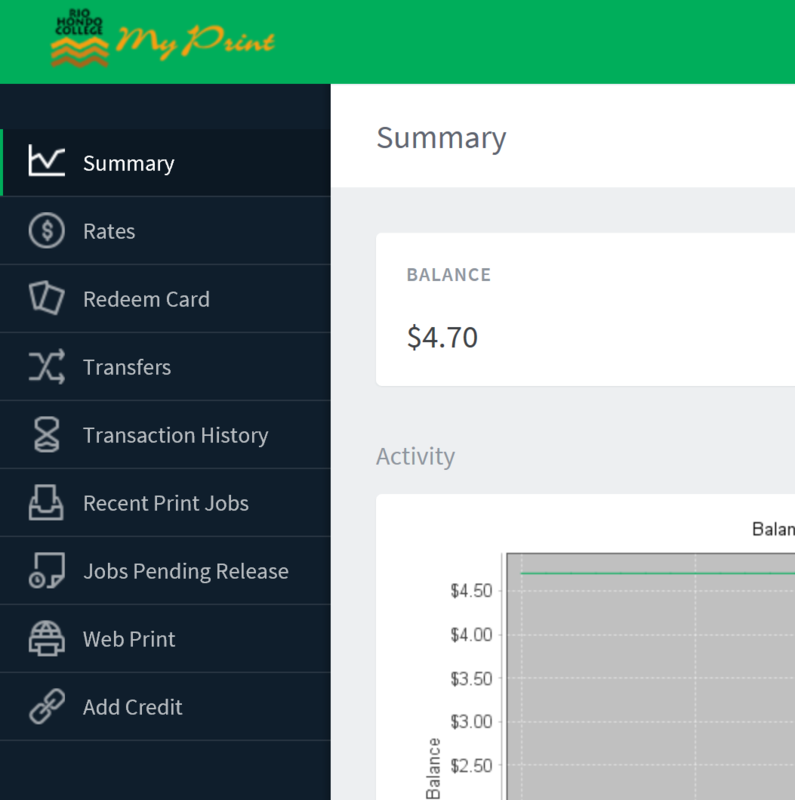 Add money to your MyPrint account from your credit/debit or PayPal account. Select “Add Credit” on left of the screen. You can now also add money from the “Bill Loader” in the Copy Center. Log in at the screen there and add as many bills to your account as you wish. Send your document to the printer – Follow the instructions on the screen. Retrieve your printout in Library Copy Center near the Circulation Desk. Use your AccessRio username and password at the release station (the PC in the copy center). Questions? See a librarian at the Reference Desk. Using MyPrint, you can also directly print from laptops and other wireless devices. Click on “Webprint.” It will list your current jobs, if any. Files will now upload, it will tell you how many pages and the price for printing them. What do I need to make photocopies? Log in to the copy machine you wish to use with your AccessRio login and password, make your copies, and be sure to log out when you’re done! I need a dollar bill. Where can I get change? How much does photocopying cost in the library? Black and white copies are $0.10 per page. Color copies are $0.50 per page. If in doubt about directions for the photocopier, ask for assistance. The library cannot refund any money for completed copies. Check the settings for the number and types of copies you request from the photocopier before copying. In the event of photocopies malfunction, please see a Circulation Desk Staff member or Reference Librarian for information and assistance.